SuperPhillip Central is doing something new for 2013. At the start of every month we will be listing the top games that will be releasing in a given month-- titles that you should without a doubt be keeping an eye out for. We know that not everyone shares the same tastes, so we have selected a wide variety of games from different genres and platforms. Not only are the game names and brief descriptions posted, but also to help plan your shopping schedule are the release dates. Note: The release dates are based off of North America. With that, let's get to the awesome games. The first game to watch out for this ridiculously packed month is one that has been receiving critical acclaim worldwide. 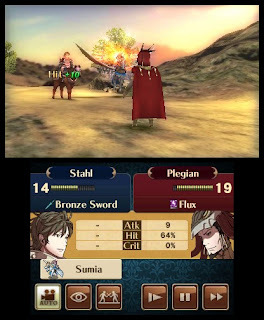 It's the first entry of the Fire Emblem franchise for Nintendo's 3DS, Fire Emblem: Awakening. This turn-based strategy RPG offers a class and job system, the ability to create a customizable avatar for battle, and now a mode that does not permanently remove a character from your roster if they perish in battle. Don't worry, as the classic rules of the franchise still apply. Nintendo 3DS owners will have a lot to play through with Awakening, and the wait to play it is almost over. 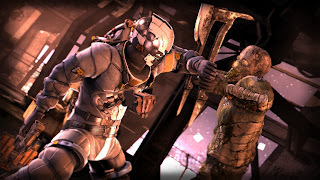 There has been a lot of skepticism and criticism towards the direction the Dead Space series has been heading. Some argue that the series is going in a direction where it's more action than the original Dead Space's survival horror feeling. Whichever side of the fence you are on the debate, I think most of us can agree that Dead Space 3 is looking mighty enticing. 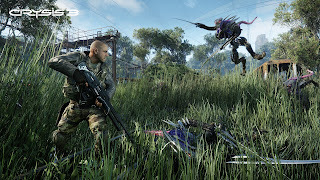 The game's campaign can be played solo or in co-op with a drop-in/drop-out feature. 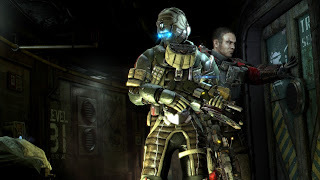 Dead Space 3 promises to have a significant amount of thrills as well as chills, and if past games have been an indication, it will have some scenes that gamers will be talking about long after the game has been put to the shelf. 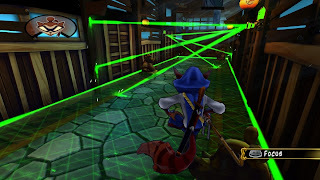 If you've picked up and played The Sly Collection (which you should have), then you know that the Sly Cooper series is a fantastic one full of sublime platforming fun. 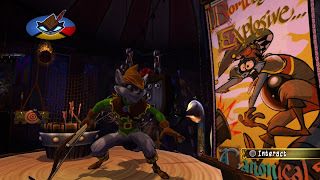 Sly and the gang's fourth outing, and the first made specifically for the PlayStation 3 and Vita, introduces costumes into the fold, which allow Sly new abilities such as a Robin Hood-like outfit that grants Sly the ability to fire arrows that create a sturdy line of rope for him to cross. 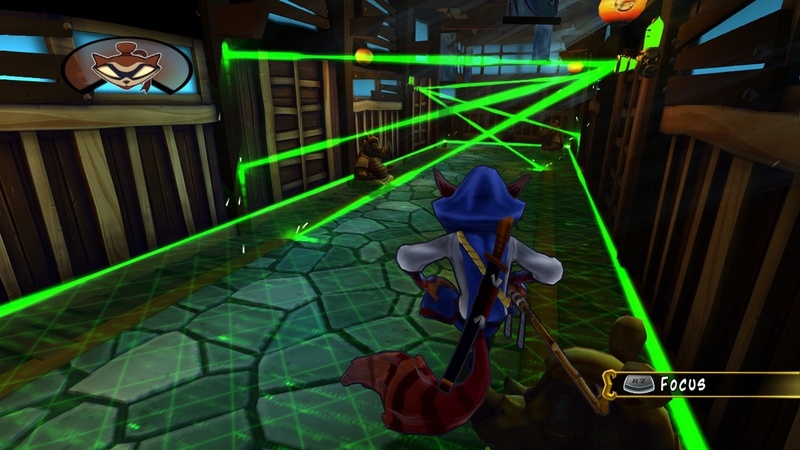 Sly Cooper: Thieves in Time will be part of Sony's Cross Buy promotion, meaning if you purchase the PS3 version, you get access to both that and a code for the Vita version. 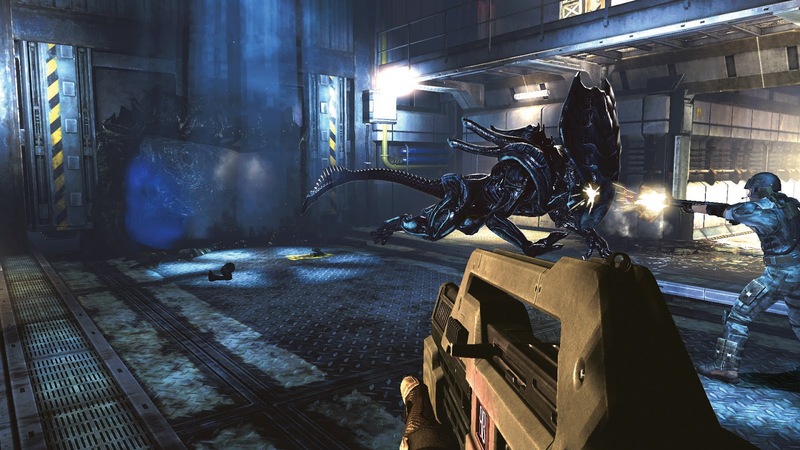 If one sci-fi horror shooter wasn't good enough for you with Dead Space 3, then you are totally in luck as Sega and Gearbox are bringing Aliens: Colonial Marines to home consoles and PC this month with a Wii U version to follow later on. Fans of Aliens will adore seeing familiar characters and the fabled weaponry of the movies, including flamethrowers and pulse rifles. 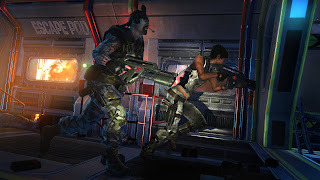 Up to four players can participate in drop-in/drop-out co-op for the main campaign, which is sure to make the game stretch out in its replay value if the ability to upgrade your character already does not. Look forward to Aliens: Colonial Marines in less than two weeks. 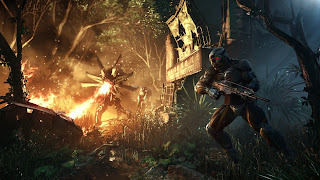 Running on the CryEngine 3 game engine, Crysis 3 is the third installment of the graphically intensive first-person shooter franchise by publisher EA. 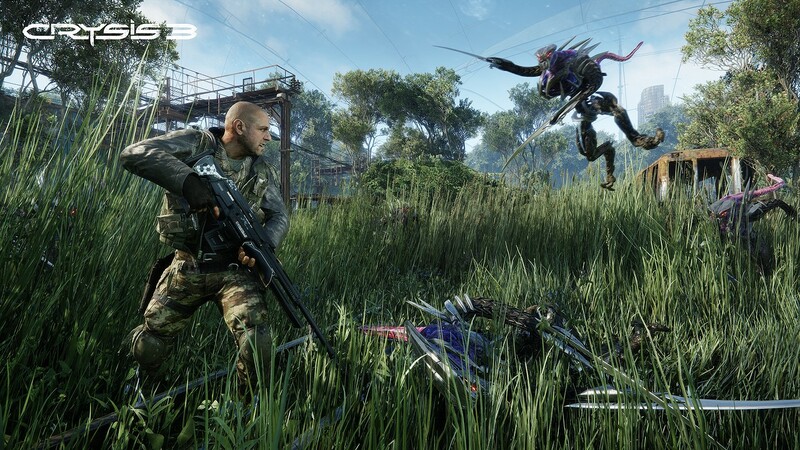 Along with the campaign mode, which promises to delight with its breathtaking vantage points and set pieces, comes an all-new mulitplayer mode, Hunter. In this mode several players are C.E.L.L. troopers while the other players are hunters. 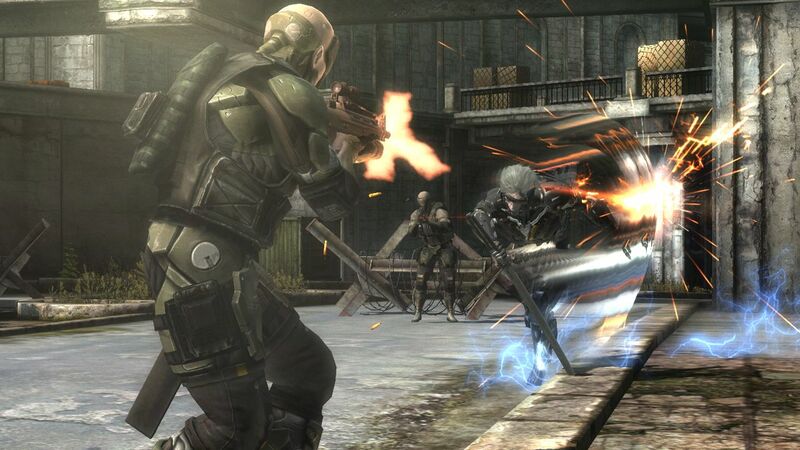 The objective of the troopers is to stay alive, or at least longer than their counterparts. If they die, they get spawned back as a hunter. Things can get particularly crazy when there is just one trooper left against a swarm of hunters. Crysis 3 shoots onto North American store shelves on the 19th. 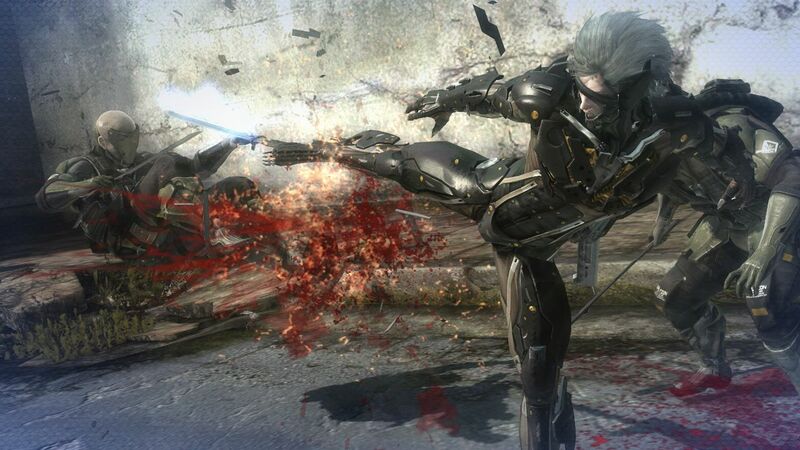 Raiden returns and is at the center of the stage for Metal Gear Rising: Revengeance, developed by the one and only Platinum Games. Most significantly about the oddly subtitled game is the ability for the player to accurately and with fine precision slice and dice foes and cut off their limbs in an effectively efficient manner. 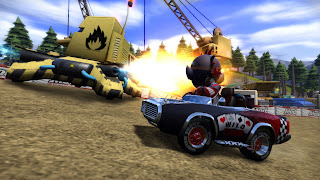 It doesn't just stop with cutting enemies, the developer showed off various objects like watermelons and vehicles that could be cut into as well. Even if you are a casual Metal Gear fan, this more action-oriented offshoot of the series is shaping up to be one "can't miss" title. After wowing the gaming world with Rayman Origins, the limbless wonder returns in an all-new Wii U exclusive platforming adventure with Rayman Legends. Right off the bat you can just ogle the positively gorgeous graphics and art style the game possesses. Alongside the traditional platforming levels, Rayman Legends has levels where the player with the Wii U GamePad interacts with enemies and objects to help the player(s) on the TV screen get through the level. 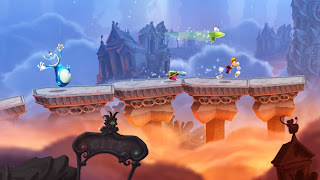 If the demo that can currently be downloaded on the Wii U eShop is anything to go by, then Rayman Legends is going to be one slap-tastic fantastic game to end the month of February, and one that all Wii U owners should look into getting. An honorable mention to these list of games is Etrian Odyssey IV: Legends of the Titan for the Nintendo 3DS. It's a remarkably niche game, but it's one that deserves at least a mention. Which games for February are you going to get? It's time once again for The Buzz, where we look at what readers of SPC are looking at the most. You might see this recurring segment and ask yourself what the heck the point is of posting what the most popular articles on SuperPhillip Central for a given time period is. Well, I can answer that. We (I don't work here alone, y'know, but I do complete most of the work) use this information not only to see how things have changed month-to-month or season-to-season, but also to post stories that will continue to interest readers both old and new. It's nice to have some perspective, and also it's nice to keep users up to date on what stories are doing the best here that they may want to look into. I know what you're thinking. What is popular on SuperPhillip Central must mean that five people read it. That's actually a lot further from the truth than you'd believe. With that, let's get to the top ten stories presently. Things have changed so much since our last look at The Buzz four months ago. Rank Up! - God of War used to rule the top, but ever since the Official PlayStation Magazine UK website is now what Google shows for a top image instead of linking to this site, that is but a memory. To make up for that, traffic is coming in from articles like the Tired of Negativity: Things Nintendo Is Doing Right With the Wii U, Top Ten Kart Racing Games, and my opinion piece on the latest Nintendo Direct. 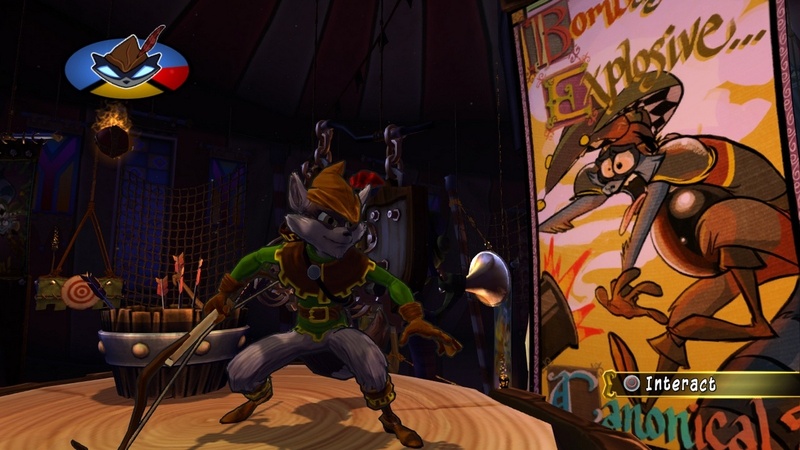 Current reviews that are popular include Trine 2: Director's Cut, Style Savvy: Trendsetters, and even Hamsterball, one of the more unlikely popular pieces on this list. I hope you will all continue enjoying SuperPhillip Central and keeping on keeping up to date on the latest stories, editorials, reviews, and interviews straight from us. but Nintendo Land on Wii U is fun all the same. The first month of 2013 brought with it eight all-new reviews. We had three-- count 'em, three!-- games that received a 9.0 out of 10. Those titles are Nintendo Land, PlayStation All-Stars Battle Royale, and Trine 2: Director's Cut. Let's not forget The Legend of Zelda: A Link to the Past which only received the best score possible: 10/10! Scribblenauts Unlimited and Wario Land II were no slouches either, earning an 8.0 and 8.75 respectively. Finally, two Nintendo 3DS games were reviewed: Skylanders: Giants (6.5) and Crosswords Plus (7.0). It was a great month of reviews featuring Nintendo and PlayStation all-stars! As a side note, I'd like to take this opportunity to let everyone know that SuperPhillip Central is approaching its historic 400th review. Do you know that Crosswords Plus review you might have read last night? It was review #391. Exactly when the 400th review will be and what game it will be are up in the air, but I hope you look forward to it all the same. It'll be here sooner than you think! 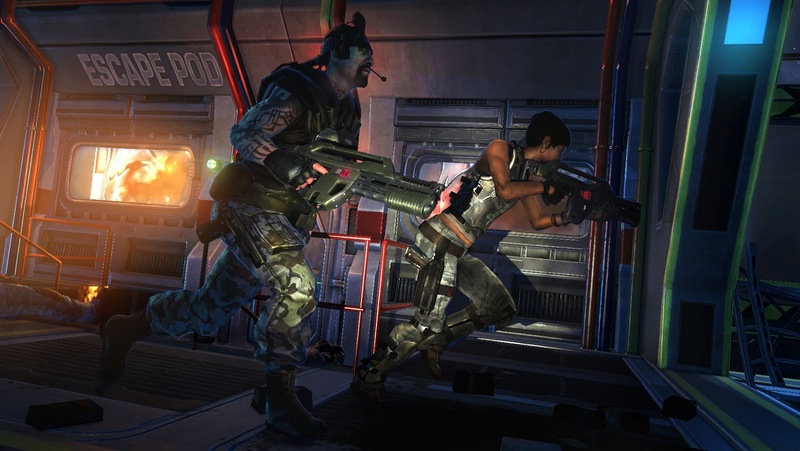 What gaming platform was home to your favorite game of 2012? Oh, boy, it was a close one this month with the PlayStation 3 just barely beating out both the Nintendo 3DS and the Wii U. Meanwhile the Xbox 360 had more votes than the Wii (I voted for the latter because of Xenoblade Chronicles, SPC's Game of the Year 2012). I wonder what games you guys and gals had as your favorites... Were they multiplatform, or were they indeed exclusive to the platform you voted for? I'll never know because I don't know the people who voted. Aw, shucks. Well, let's get to this month's poll! The rumors of the next generation consoles from Sony and Microsoft have set the Internet abuzz. Some have grown weary of tech talk, shader talk, and so forth, while others can't get enough of it. Regardless, concerning the other two next gen platforms, which do you think will launch first? This is a simple poll this month with only two answers as to not overheat your minds from thinking too much. Poll will close at the end of February 28. Welcome to Thursday night here at SuperPhillip Central. We have reached the end of the month, but before January ends, let's take a look at one more new review. I'm sure this one has kept you up waiting at night for some more people to finally review it. 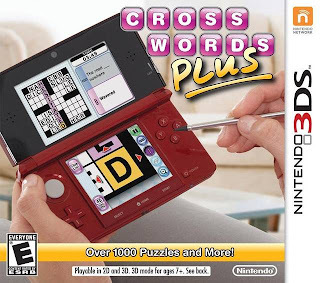 Well wait no longer as here is my review of Crosswords Plus for the Nintendo 3DS. If you are a wordsmith like I am or a person who enjoys flexing their mental muscle, then you probably love solving word puzzles such as crosswords, word searches (aka seek-and-finds), and anagrams. If not, then this following game will probably not interest you. 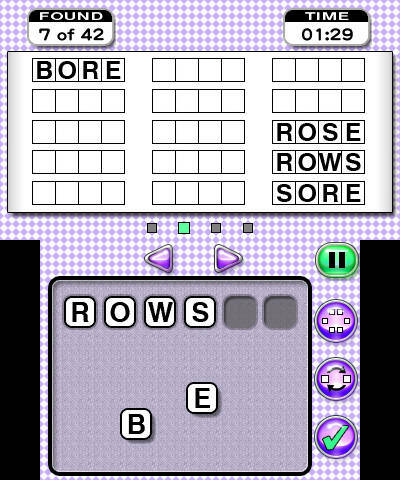 For the rest of us, Crosswords Plus for the Nintendo 3DS encompasses all of these aforementioned types of word puzzles on one game card. Is Crosswords Plus a better alternative than those ninety-nine cent books you can find at the checkout lane of your local supermarket? 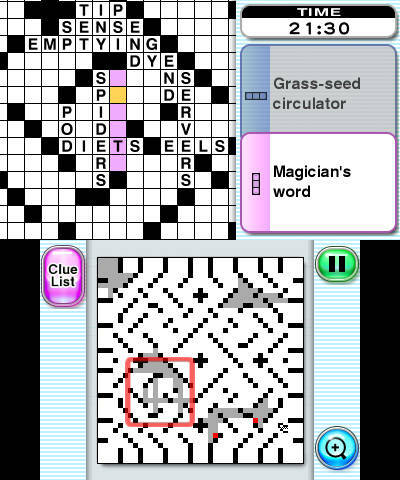 The main attraction to Crosswords Plus is obviously the crossword puzzles, as the title of the game heavily suggests. However, aside from the crosswords there are word searches and anagram puzzles to play as well. 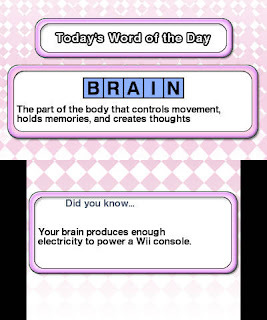 The only catch is that these are timed unlocks, meaning you have to wait at least one day (or mess with your 3DS system's internal clock) to unlock word searches, and another day for anagram puzzles. it's either go big or go home. Crosswords come in various difficulties starting with easy. Each difficulty contains upwards of 200 different crosswords spread across numerous pages. Each page holds twenty puzzles, from simple 4 x 4 sized affairs up to 11 x 11 sized and beyond. Clues on easy mode are far less cryptic than those in later difficulties. If one does get stuck on a puzzle, whether a clue is too tricky or they simply cannot think of the right letter to place in that last square, they can spend hint points, of which there are a limited amount for each crossword puzzle. Spending one hint point will offer an additional clue, three hint points will reveal an additional letter, and five hint points will simply show the entire word. With using these hint points come time penalties, so using these should be a last resort. To help out with any challenges beginning players or neophytes of technology might have with playing Crosswords Plus in general are How to Play tutorials which teach the basics of how to control the game. Even still, it is relatively easy to play the game. 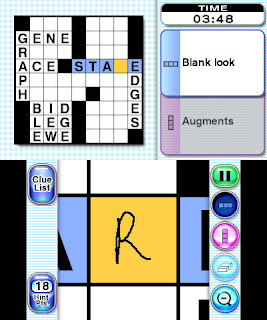 By selecting a box on the crossword, a player can zoom in and start writing. Depending on whether the horizontal or vertical button is toggled, the game will automatically scroll to the next box as letters are written in. Additionally, players can turn on and off a notification that lets them know when they have written a wrong letter into a box. 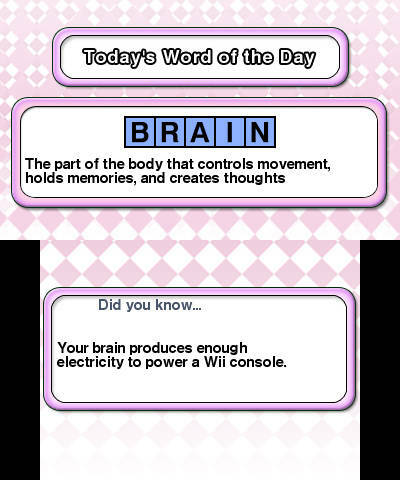 On the subject of writing, those familiar with the handwriting recognition techniques of such Nintendo DS titles like those of the Brain Age series will feel right (or is it "write"?) at home with Crosswords Plus. The technology is not perfect, as the game can mistake one letter for another (especially lowercase c's and lowercase e's), but the frustration caused by this is only momentary and does not really affect the enjoyment of the game. perhaps the recognition will give you problems. With the grand amount of small to gargantuan-sized 31 x 31 puzzles featured in Crosswords Plus, one would suspect to see a lot of repeated words showing up in the puzzles. Well, that is exactly what happens with the game. There are only so many ways to write clues for the word "sly" before you start getting sick of seeing the word show up. And if I have to see another "ens", "ems", "ess", and other letters spelled out in long form, it will be too soon. Outside of crosswords in the game there are word searches. There are 160 small puzzles (they fit inside the bottom screen of the 3DS) and 60 large puzzles (where the player needs to use the d-pad or Circle Pad to pan around the puzzle). 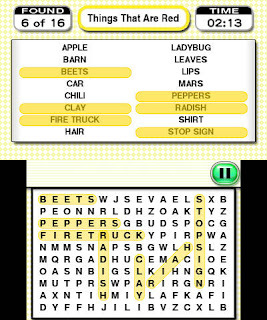 The words are hidden in each puzzle forwards, backwards, and diagonally, with more words showing up in the larger puzzles. By simply touching the start of a word in the puzzle and dragging the stylus across to its end, that word is considered found and crossed off the list on the top screen. minutes at a time to unwind. The final piece to Crosswords Plus are anagrams. For the uninitiated, these puzzles give the player a series of letters and tasks them with finding all of the words that can be made out of those letters. For instance, the word "prudes" can have the player find "super", "red", "rude", and so forth in it. Coincidentally, those are words that describe yours truly quite well. Some complaints regarding Nintendo's first crossword game, simply titled CrossworDS in North America, was that there was nothing in the way of downloadable content. 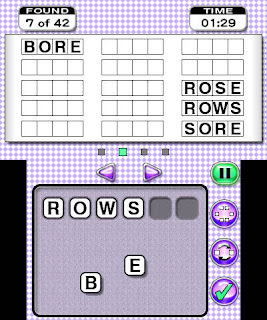 Nintendo has remedied this with the 3DS sequel, offering weekly crosswords that show up in the bonus section of the crosswords menu. Along with that to keep players coming back for more is the Word of the Day, which brings some more variety to the game. power an old model PS3. Another complaint concerning the Nintendo DS original was the lack of much in the way of an impressive presentation. Everything was pretty generic. Unlike the DLC situation, this has not been improved. It is the same vanilla presentation as one would expect for a game dealing with word puzzles. It's a shame that the visuals lack a powerful or interesting punch, but the game is serviceable regardless. Not even the 3D surprised as it is usually turned off until the congratulations screen after each puzzle is completed. Recommending Crosswords Plus would be absolutely easy at a a twenty dollar price point. It offers a robust array of puzzles that put those aforementioned checkout line puzzle books to shame. However, Crosswords Plus is not twenty dollars. For some reason Nintendo had decided to release the game for thirty bucks. It becomes more challenging to recommend this game for that price. That said, if you can somehow find it cheaper, Crosswords Plus will delight with its large number of available puzzles (with more added each week) and intuitive control scheme. 2012 saw the release of two terrific kart racing games: Sonic & All-Stars Racing Transformed and LittleBigPlanet Karting. That got me in the mood to come up with a list of the all-time greatest kart racers through the opinion of yours truly. 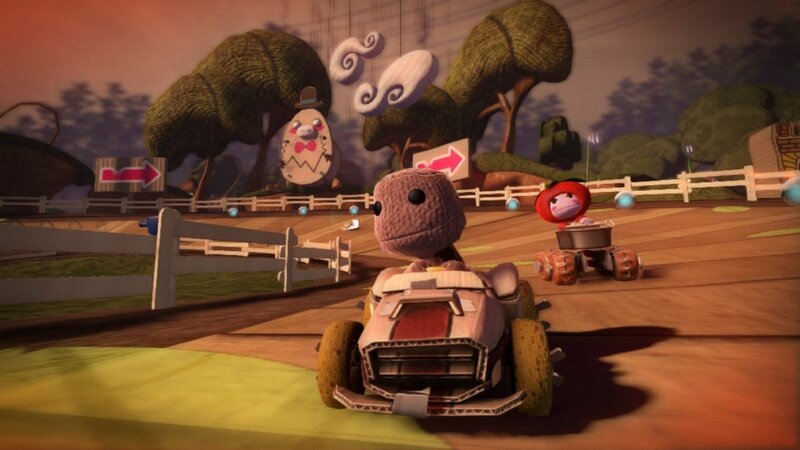 From Mario, to Sonic, to Sackboy, which characters burn rubber the best? I was one of the people who after looking past the long load times found a kart racing game that was full of fun and charm. It was United Front Games' ModNation Racers. Customization was the name of the game, with you being able to create your own avatars, karts, and tracks and share them with the online community. 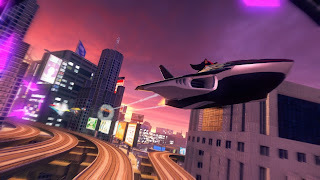 And if you didn't have a creative bone in your body, at least you could race freely in the story mode or check out what members of the ModNation community crafted. Combine all that with easy to pick up controls, and you had one respectable racer for Sony's PlayStation 3. When ModNation Racers was unveiled, many wondered why Sony didn't simply tie in Sackboy and the LittleBigPlanet IP to it since creation was that franchise's main claim to fame. 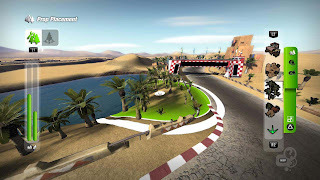 Well, United Front Games took the concept of ModNation Racers and fleshed it out even further to allow a supreme amount of cart and track customization. 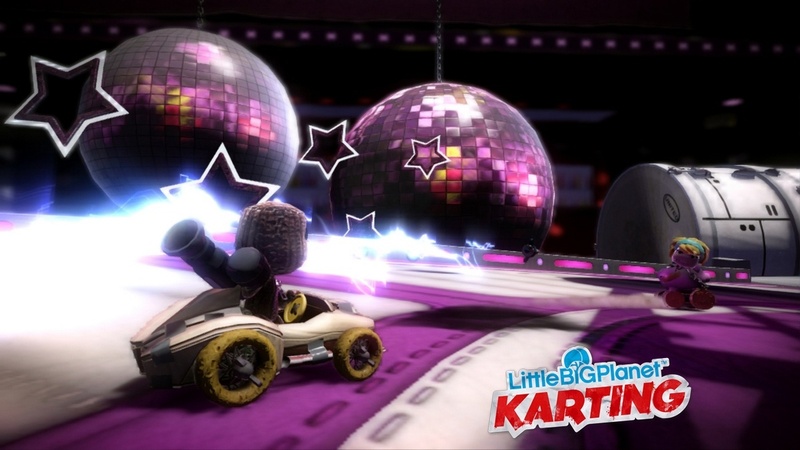 Just looking at a sample of what the LittleBigPlanet Karting community has created will fill you with a wonderful sense of awe. Perhaps it will inspire you to come up with your own compelling and engaging tracks to share with the world! Oh, and the actual racing isn't too shabby either, and even incorporates various gizmos from the platforming LittleBigPlanet games! 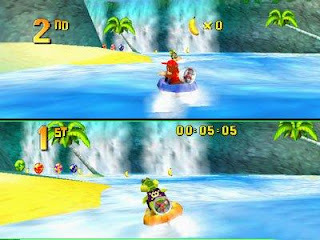 Taking some cues from Mario Kart 7, Sonic & All-Stars Racing Transformed allowed karts to transform mid-race into boats as well as planes for when the need presented itself. One moment you'd be peeling around a corner, burning rubber, and then the next you'd be flying off a ramp and shape-shifting into a plane to jet over chasms. Unlike the original Sonic & SEGA kart racer, there was a wider range of franchises being represented, either through roster selections or tracks. From Skies of Arcadia to Shinobi, SEGA fans got a healthy dose of nostalgia. While I still prefer the original to the sequel (for now), All-Stars Racing Transformed is a superb racer all in its own right. The seminal kart racing game, every other game on this list has Super Mario Kart to thank for building the foundation and popularity of the kart racing genre. 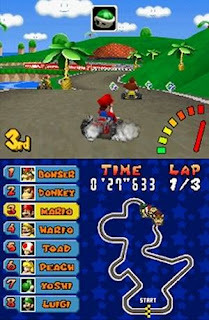 Like Mario Kart 64, the single player component might not last long, but this genre is known to be for multiplayer sessions, perhaps of the all night variety. The Mode 7 graphics delivered in creating the sense of three-dimensional tracks, and the game brought with it features that all Mario Karts after would use. 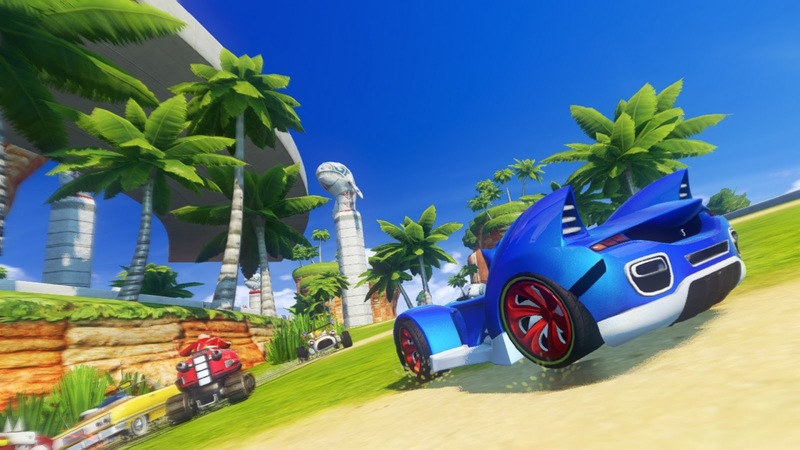 The reasons it isn't higher on the list is because not only is the game limited to two players, but the kart racing genre has since evolved. 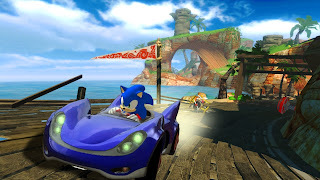 The game that when I reviewed it I said was better than Nintendo's own Mario Kart Wii, Sumo Digital's Sonic & SEGA All-Stars Racing featured simplistic to pick up and enjoy gameplay, a cast of familiar and not-so-familiar SEGA all-stars, and some of the most entertaining tracks in recent memory. 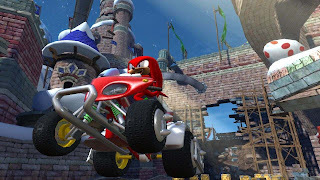 Most importantly to me, and why I did say the game was better than Mario Kart Wii, was that Sonic and SEGA's first kart racing romp together was actually fair. There were no last lap, last second blue shells to screw you out of a win that you deserved. Instead, skill was a very important portion of the gameplay experience with this game. It doesn't hurt that I am a sucker for SEGA either. 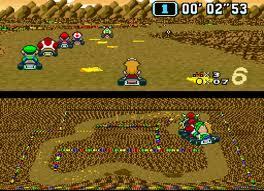 The first big multiplayer game for the Nintendo 64, Mario Kart 64 offered four player karting action and endless nights of entertainment. I recall sleepovers where the Nintendo 64 controllers were passed around like flyers at a PTA meeting. No one wanted to stop, and we ended up playing long into the night and into the wee hours of the morning. Needless to say, my friends and I were all rather cranky in the afternoon, going off a few hours of sleep. 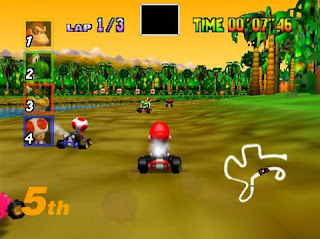 Mario Kart 64 brought the series to 3D, showing off fantastic and multi-tiered track designs (including my favorite version of Bowser's Castle to date), fast and frenetic racing fun, and a super-catchy soundtrack. My only two beefs with the game come from it being a bit boring alone, and the computer going into overdrive to simply catch up with you. 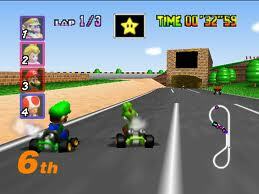 Other than those minor things, Mario Kart 64 is still great to this day. You might be surprised at my favorite home console Mario Kart game. It's none other than the GameCube's Mario Kart: Double Dash!! This installment of the franchise implemented an innovative and brilliant mechanic, two racers per kart, both of whom could switch driver/item launcher positions on the fly mid-race. What I love about this entry isn't just one thing. 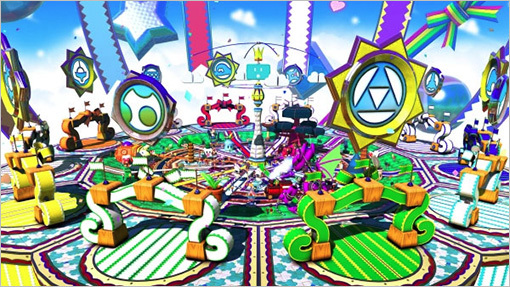 I adore the course design and locale choices such as Peach Beach, Sherbet Land, and Mushroom City. I love the character specific items, the cheery soundtrack, and the teamwork necessary to cross the finish line in first place. Double Dash!! might not be as cherished as say, Super Mario Kart or Mario Kart 64, but it's a title that I certainly enjoy greatly. 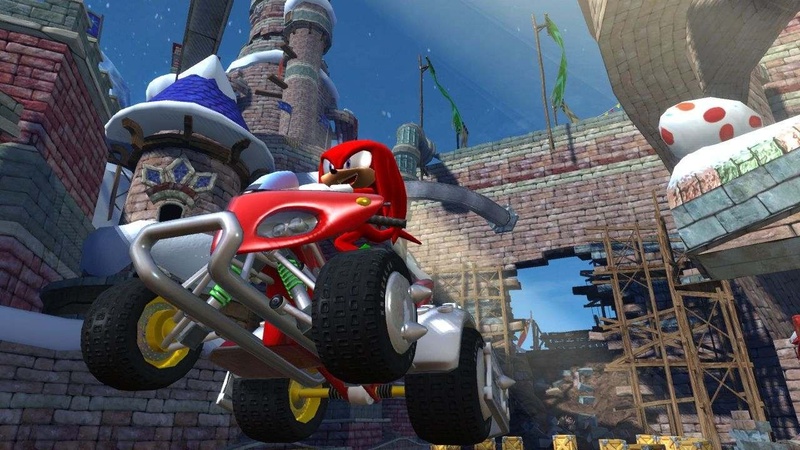 Sony saw Rare's success with their kart racing game, so the PlayStation manufacturer tasked developer Naughty Dog with creating their own kart racer with their-- at the time-- mascot, Crash Bandicoot. 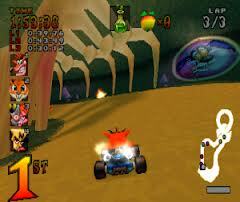 The end result was Crash Team Racing, number three on this list. 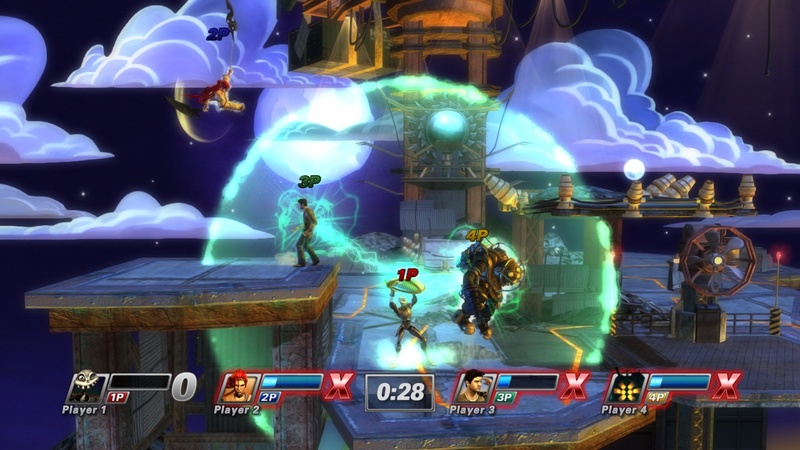 This game offered gameplay for all: single players could compete against the computer and gain trinkets and gems in Adventure Mode, while multiple players (up to four with the Multitap peripheral) could battle it out in highly competitive races. 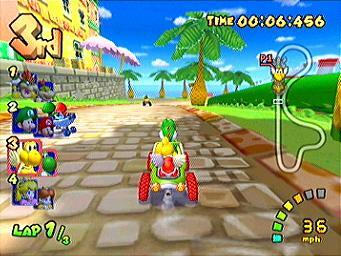 The controls were as tight as one could want with a kart racer, allowing any level of player to get in on the fun. 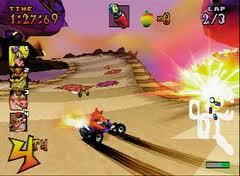 Perhaps the only gripe to be had with Crash Team Racing is the "just there" music and sound. The top Mario Kart title on our list hits the number two spot on our countdown. It's Mario Kart DS, one of Nintendo first attempts at an online game. 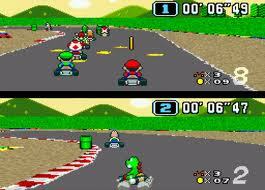 While the infrastructure was seemingly something stuck in the nineties, it allowed solo players to race with strangers or friends from across the globe. And who couldn't get enough of all those phallic emblems? Also added to the franchise was an abundance of different karts, entertaining new tracks like Walugi Pinball, Delfino Square, Airship Fortress, Luigi's Mansion, and Tick Tock Clock, as well as the return of classic tracks via the four Retro Cups. Mario Kart DS delivered the most features, fun tracks and gameplay to make it the number two kart racer on this list. 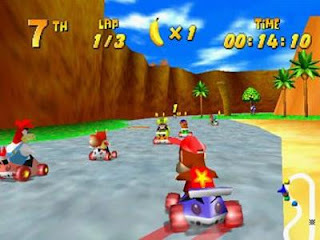 The best kart racer on the market, still after more than fifteen years, Diddy Kong Racing was no doubt modeled heavily after Nintendo's own Mario Kart franchise. 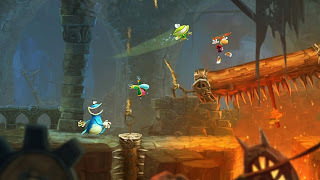 However, Rare taught the old genre some new tricks by introducing an adventure mode to go along with the entertaining gameplay. By typing in a code (Jointventure) two players could try to stop the almighty Wizpig from taking over Timber's island. Not only was that brought to the fold, but so was the addition of three vehicle types. There were the standard karts, but then there were hovercrafts and planes as well. Diddy Kong Racing was packed to the brim with content, challenge, and most importantly, fun. Just one word of caution: you should avoid the awful Nintendo DS version! My work here is done. It's time I drive off into the sunset and ignore every speed limit sign on the way. 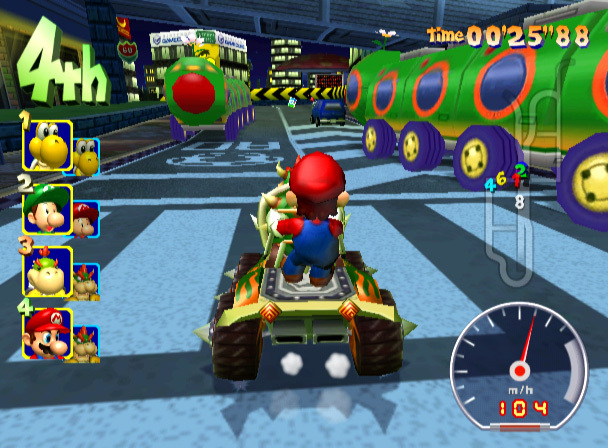 In the meantime, what are your favorite kart racers of all time? Post your faves or any disagreements below. In the U.S., Hyrule Historia is the top book on Amazon's Bestseller list. Why not delve into one of my most favorite video games of all time, The Legend of Zelda: A Link to the Past? I've no doubt played the game from opening to credits over fifty times. Now, that might not be anywhere close to the more devoted gamers out there, but it's a big deal for me. Regardless, let's get to this special retro review. 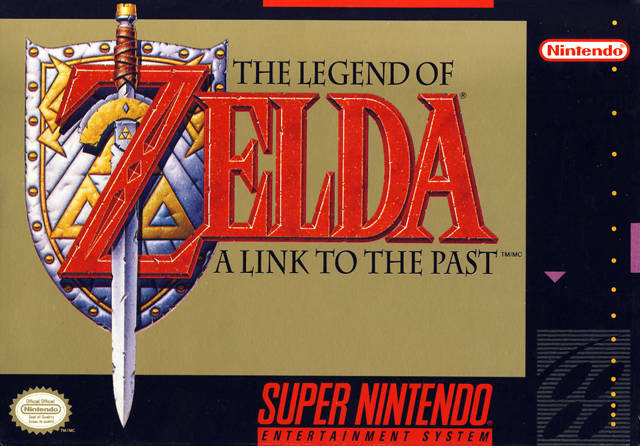 In 1991, The Legend of Zelda series returned to its overhead roots with The Legend of Zelda: A Link to the Past. While it returned to that old perspective, it brought with it many, many new ideas-- ideas that many developers consistently borrow from, including Nintendo themselves-- to the franchise. 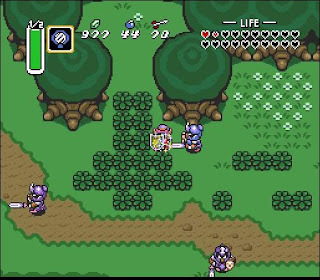 On a list of important games and those games that are as close to perfection as possible, The Legend of Zelda: A Link to the Past sits comfortably near the top. As if you needed any reasons why, here's several. On a dark and stormy night, a young lad named Link is awakened, not by the rumbling of thunder and strikes of lightning, but the voice of a girl, who turns out to be Princess Zelda, utilizing the power of telepathy. Link's uncle heads out to rescue the princess by himself and asks Link to stay in bed. Going against his uncle's wishes (and thankfully so, as the game would be really boring if all the player did was to hang around the house all day), Link heads to Hyrule Castle, where he finds his uncle, stricken with a serious wound. 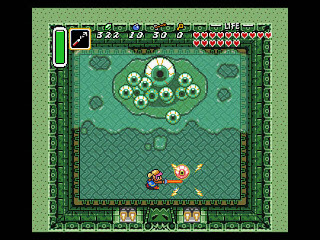 Acquiring his uncle's sword and shield, Link enters the castle's dungeon, finds and frees Zelda, and the two escape through the castle's sewer system. They arrive at a sanctuary where players find out about a sorcerer named Agahnim who plans on breaking the seal that holds Ganon. In order to attain the only weapon that can defeat Agahnim, the Master Sword, Link must gather the three magical pendants to prove his worth. The story of A Link to the Past entices the player and puts him or her straight into the boots of Nintendo's fabled hero. It doesn't get in the way of the game too terribly much, just enough to keep the player engaged. Well, Link always was a rebellious young youth. The original Legend of Zelda on the Nintendo Entertainment System was groundbreaking onto itself. 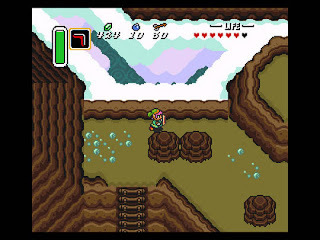 While Zelda II: The Adventure of Link moved into totally new territory with its 2D side-scrolling action, The Legend of Zelda: A Link to the Past returns to the series's comfort zone, an overhead viewpoint. Like the original game, The Legend of Zelda: A Link to the Past is also groundbreaking, and it is easily a true evolution to the NES classic. For one, combat is less stressful due to the fact that Link's sword now slices sideways to create a much broader swing. 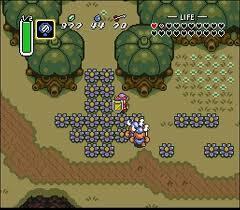 Link can also walk diagonally to make moving much easier and gives a greater sense of freedom. The kingdom of Hyrule, Light World version. 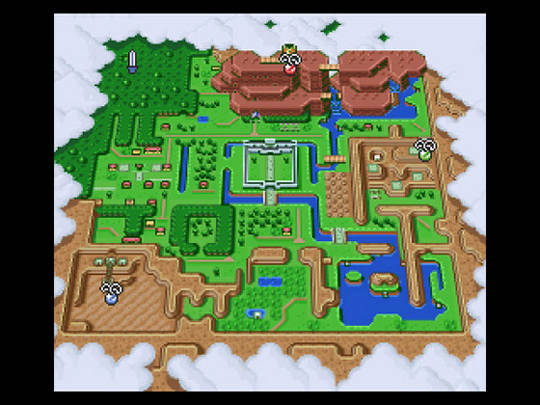 A revolutionary idea that Shigeru Miyamoto and the rest of the development team implemented into A Link to the Past was a parallel world system, one that would be used many times throughout the course of the Zelda franchise. After a few dungeons in the game, Link gets transported into the Dark World, a similar in structure world to Hyrule, but full of much more challenging creatures and uninviting areas. For instance, the water in the Dark World is murky as can be and the grass is as dead as disco. With the Magic Mirror item, Link can freely transport from the Dark World to the Light World. This feature is used to great effect for puzzles. Areas in both worlds are similar, but Link can exploit-- for lack of a better word-- subtle differences in each world's structures to his own benefit. A cliff in the Light World might seem impossible to reach at first, but by heading to the Dark World and using the Magic Mirror where the cliff stood in the Light World, Link can transport himself to the Light World and find himself standing atop the once impossible to reach area. World and the Dark World. The Legend of Zelda: A Link to the Past built the foundation for how future Zelda games would be crafted. 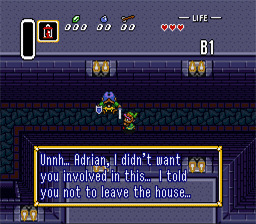 What I really enjoy about Zelda's Super Nintendo entry is how there is very little in the way of exposition between dungeons within the game. 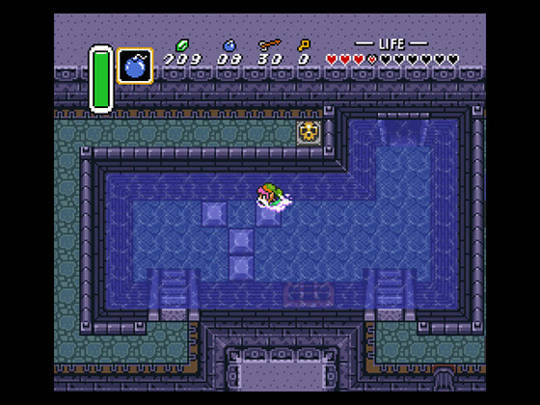 After one dungeon is complete, you can pretty much trek to the next without much in the way of filler, something that recent Zelda games could learn a thing or two from. There are over a dozen different dungeons in A Link to the Past, still the most in a single Zelda game (I consider Oracle of Ages and Oracle of Seasons two different titles). You might be thinking that it is quantity over quality, but A Link to the Past offers both things equally. The dungeon design is absolutely fantastic. 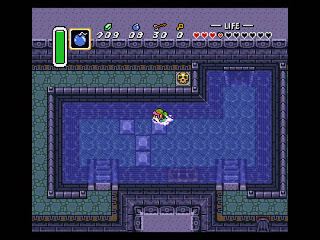 For those unfamiliar with The Legend of Zelda, dungeons consist of finding keys through venturing in rooms and solving puzzles to make progress. Each dungeon has a valuable treasure that is usually to be used on the boss that awaits Link at the tail end. 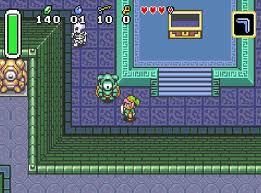 With this Super Nintendo Zelda game, dungeons were given a greater sense of purpose and personality. in the game's many dungeons? The game is constantly experimenting with new dungeon ideas is why.. A Link to the Past brought with it themed dungeons instead of the basic and generically structured dungeons from the original Zelda. There's desert dungeons, flooded dungeons, dungeons with entrances and exits spread out across a wooded area, a dungeon in the middle of a town, a mountainous dungeon, an icy dungeon, and so many more, at the time, unique ideas. The floor plans are also much more interesting to look at with differently sized rooms to explore. interior to go along with its chilling exterior. 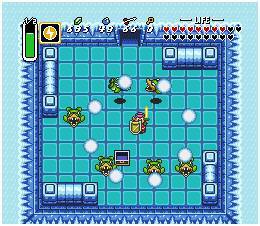 A Link to the Past also offered a series first, multi-tiered dungeons. In the game it is important to consider where you are, so if you have to fall to a lower floor, for example, you fall in the correct place. Thankfully, helpful trinkets found in treasure chests like Maps and Compasses give the player a sense of where they are in a dungeon and identifies where the boss's chamber is located, too. Puzzles are a Zelda series mainstay, and A Link to the Past delivers greatly in this field as well. They can be as simple as pushing the right block to activate a door, lighting four torches to open the way, or hitting colored switches that change which blocks are raised (i.e. impossible to pass) and which aren't. I love the idea of having a fantastic mix of brawn and brain, which this Zelda game excels in. There are equal parts of using one's brain on figuring out how to proceed in a given room, and using Link's sword or other weapon to slay monsters in a myriad of manners. can dog paddle over these blocks. Speaking of using brains and brawn equally, each dungeon in A Link to the Past concludes with a boss battle. As stated, usually the weapon or item found within the dungeon is the one to be used on the boss. Even then, using the weapon correctly and at the right time makes all the difference too. Link will certainly have his hands full in his quest to save the kingdom of Hyrule because he will have to deal with armored knights, sand worms, giant moths, terrible thieves, lightning bolt-shooting eyeballs, and yes, Agahnim and Ganon, among many other unsightly and powerful monstrosities. With this boss, the "eyes" have it. 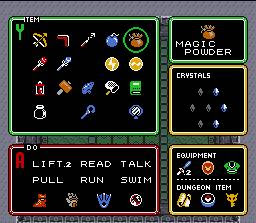 Items are an important piece of Zelda games, and A Link to the Past introduced many mainstays that would go on to be invaluable assets to Link's arsenal in future games. For one, the Hookshot allows Link to grapple onto certain objects and them pull himself over to it, making chasms easy to cross. The Pegasus Boots meant slowly trudging along the overworld and in dungeons could be a thing of the past as Link zipped through areas. 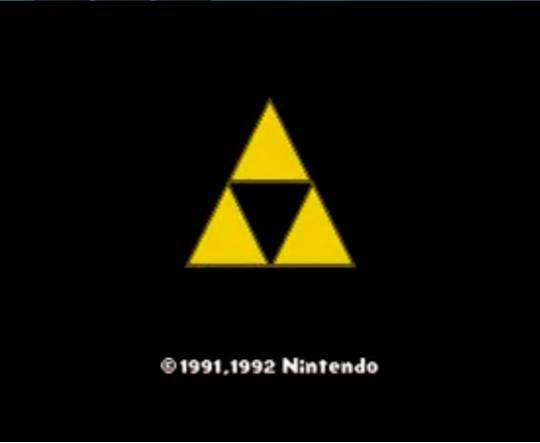 A Link to the Past introduced the Master Sword, a divine blade that would be in a multitude of Zelda games after. Items are easily accessible through the menu. In addition to items, A Link to the Past expanded on the idea of Heart Containers. 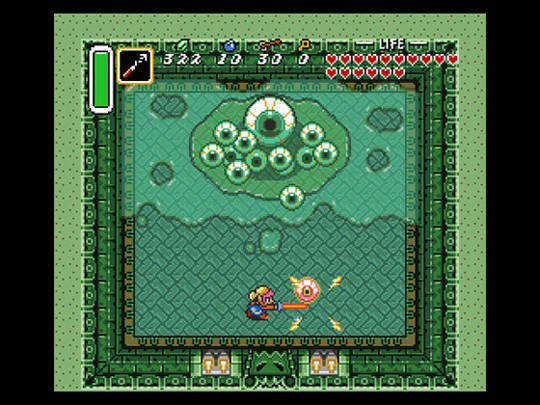 In the original NES Zelda, all the player had to do to increase Link's health was to collect a Heart Container and it would automatically add a heart to his health. While bosses do drop full Heart Containers, in A Link to the Past, the majority of health earned is done so by collecting Pieces of Heart. Collecting four pieces raises Link's maximum health. These are placed in out of the way locations and easy-to-miss spots. Not only do the Pieces of Heart help the player survive longer, but they also extend the replay value of the game longer as well. 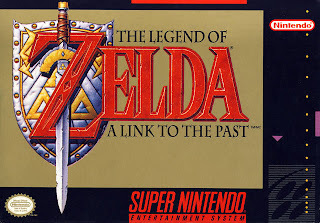 The Legend of Zelda: A Link to the Past was a lovely looking title when it launched in 1991. It still looks great today. Character sprites are wonderfully done, animations are smooth, especially when it concerns larger sprites such as the various bosses, and the backgrounds and worlds are beautiful and well detailed. The only problem that came up with the performance of the game was when there was a lot of action going on the screen. The frame-rate stutters during these moments, but it isn't enough to ruin the experience at all. On the sound side, Koji Kondo provided a stellar soundtrack with numerous themes that have since entered gamers' consciousness like Zelda's Lullaby, the theme of Kakariko Village, and many other sensationally composed pieces. look at (not so much to visit). In a lot of cases with game reviews, statements that can be viewed as hyperbole are usually just that. However, with a select group of games, including The Legend of Zelda: A Link to the Past, what may seem as hyperbolic is actually quite true. A Link to the Past is not just a great game, but it is one of the greatest games of all time. It is very much required playing for anyone who considers themselves to be a gamer. It is a title that still plays as well as it did decades ago when it originally released, it is a title that even after years of not playing it, I still somehow knew where nearly all of the Pieces of Heart and secrets were located, and it is a title that still shows me new things with each passing play-through. The Legend of Zelda: A Link to the Past shows that games from the 16-bit era can still hold up well and can even impress more than their current day counterparts. A Link to the Past is marvelous magic put on a game cartridge, and it shows exactly why The Legend of Zelda series is so highly regarded.